When I think about how I was able to bring more self-compassion into my life, one thing really sticks out- how I treated others. Now, I have always been a compassionate person and loved very deeply. However, I am not taking about simply loving and feeling compassion. I am talking about living out that compassion with the hard things- practicing those hard things like letting go if someone hurts you, forgiving someone when you rather be stubborn, putting others first, etc. These are things that can be very difficult to do when it comes to loving someone else. Sometimes our pride, stubbornness, expectations, and our own problem with perfectionism makes practicing complete compassion for others hard. When I started to look inward and realized that my own perfectionist tendencies, high expectations of myself, and perfectionist personality was maybe affecting how I treated others (or maybe not even treated, but how I thought of others or how I held on to things), then I was able to start separating the two. When we really love someone, we want the best for them and showing them endless compassion makes sense. Showing more compassion through forgiveness and letting go helped me to be able to show more self-compassion to myself. And well, I guess that makes sense. What you put out into the world, you get back. What you practice becomes familiar. How you make others feel is returned. When we think of the loved ones in our lives, what is it that we strive to do? Supporting others, loving unconditionally, understanding and letting go of others mistakes that may hurt us, patience when they experience struggles and respect....all of these things can be mirrored back to the way we treat ourselves. 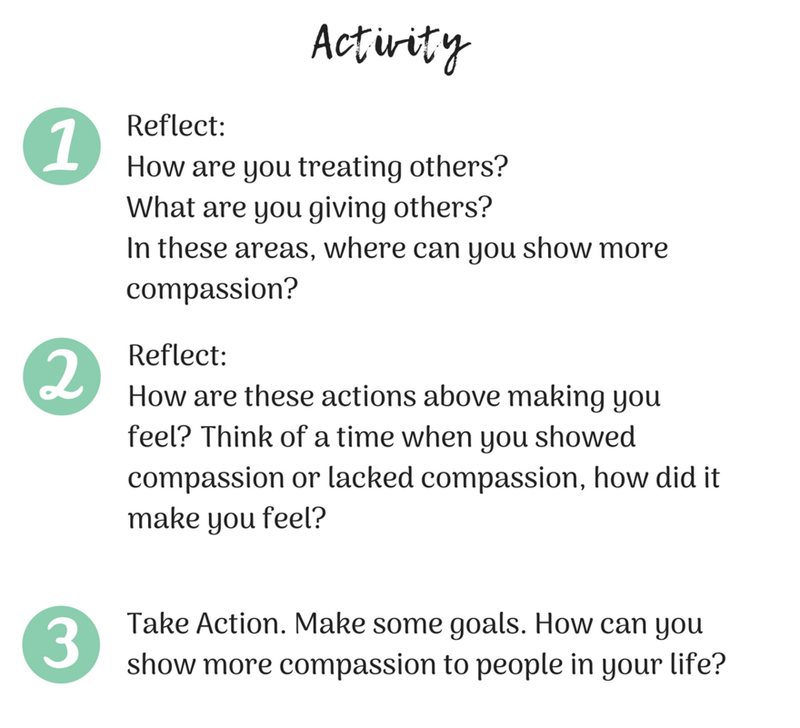 So today, I want you to reflect on the compassion you show others with the activity below. Remember, "if you want others to be happy, practice compassion. When you want to be happy, practice compassion." It is a win-win.